In my previous article, I talked about cleaning your lenses and your camera. It’s time to tackle a bigger, more complex subject: cleaning your sensor! If you shoot a lot, and especially if you shoot mirrorless, you definitely need to clean your sensor. If you have never done it, it can be quite intimidating, as you don’t want to damage your camera. If that’s your case, you may want to consider a professional sensor cleaning at your local camera store. But if you have to clean your sensor often (say, because you shoot mirrorless) or if you’re not close to a camera store that offers this service, here’s a guide to clean your sensor. If, while processing your images, you don’t notice any dust spots, you probably don’t need to clean your sensor. Given it’s a bit of procedure, there’s no reason to do it “just in case.” If you really want to check for dust spots (if you have a big trip or a big job coming up), then here’s how: take a photo of a white/gray empty wall at ISO 100 and f/22. Open your file in Lightroom, go to the Develop Module, and open the Spot Removal Tool. At the bottom left of the screen, check the “Visualize Spots” box and play with the slider to see if there are spots. This technique also works to check for spots after your cleaning, to make sure you removed everything. First, you need to do your cleaning in a space that is clean and relatively dustless. One way to do that is to have the hot water run in your bathroom for a while, so it gets humid in there. Stop the water and let the room cool down. The humidity will take down the dust that was in suspension. Of course, the surface where you are cleaning should be clean and without dust. You’ll also want a good light source close by to see inside the camera chamber. If you are cleaning a DSLR, you’ll need to lock your mirror up. Refer to your manual to see where to do that in your settings. If, for some reason, this is not an option on your camera, set it to Bulb Mode and make sure your battery is full (you don’t want the mirror to close while you’re cleaning). Use a shutter release so you don’t have to keep your finger on the shutter. Again, a dust blower is a good first step to remove dust in your sensor chamber. It can be very effective, and when on location, it might just be enough. With a DSLR, I recommend using the blower first before you put the mirror up, and then another time after. To clean your sensor, you’ll want a blower that has a one-way valve and does not redistribute dust. I recommend the Giottos Rocket Blaster. The goal of a static brush is to remove dust with static electricity. I highly recommend Visible Dust’s Arctic Butterfly 724s. It’s expensive, but it’s worth it. It’s easy to use: use the motor to charge the brush, then turn it off and turn the lights on. Just brush the sensor a few times, and that’s it! For more information about the Arctic Butterfly Brush, check out my recent review. If it isn’t enough to clean your sensor, the next step is wet cleaning. It’s more involved and requires a little more concentration. You’re going to apply a brush with liquid to remove smears and other dirt. 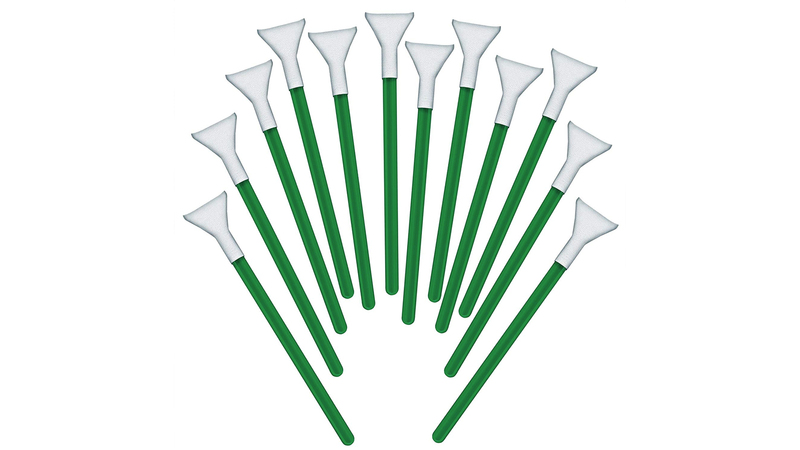 The first and most common option is sensor swabs. I recommend the kits from Visible Dust, that I’ve been using for several years. They have two kinds, in different sizes (depending on your sensor size). Each kit includes 5 swabs and cleaning solution. DUALPOWER-X Regular Strength: includes a solution for water-based contaminations such as condensation, saliva, or streaks. DUALPOWER-X Extra Strength: includes a solution for strong contamination buildups such as heavy oils, stains, lubricants, and smears. Set up your camera face-up. Get one swab and the solution bottle. Wet each end of the swab with a drop of the solution. Then swab the sensor from left to right or right to left. DO NOT re-use swabs or apply different solutions. They are one-time use and solutions are for very specific uses. While I haven’t personally used the Sensor Gel Stick, I’ve heard good things about it. It’s basically a reusable swab, which is a big plus. Beware of fake products on Amazon, and buy on Photography Life, the only authorized retailer in North America. As I mentioned, to check the results, you can use the same technique with Lightroom. However, you can also use a Sensor Loupe to get instant results during the cleaning. It will avoid wasting swabs or back-and-forths with your camera and your computer, risking to contaminate the sensor. I hope this gives you some good tools and advice to clean your sensor yourself. What other tools do like to use? Leave a comment below! When you use a blower inside your camera body, turn the body so the lens mount is pointed down. This way any dust you dislodge might fall out of the camera. Otherwise you may be just pushing it into another location. You should also clean the mount side of the lens. But don’t use a blower here, if you do you stand a very good chance of blowing dust inside the lens where it can’t be reached. Use a static brush like mentioned above. If you have an In Body Image Stabilization (IBIS) camera, you might want to consider sending it in for cleaning by the manufacturer. The sensor floats, and its possible that you could damage something. On the positive side, IBIS based systems usually vibrate at startup to knock off dust so its less of an issue. Very good points, Robert! Especially turning the camera body so the opening is pointed down.